You can download the case study for print here. 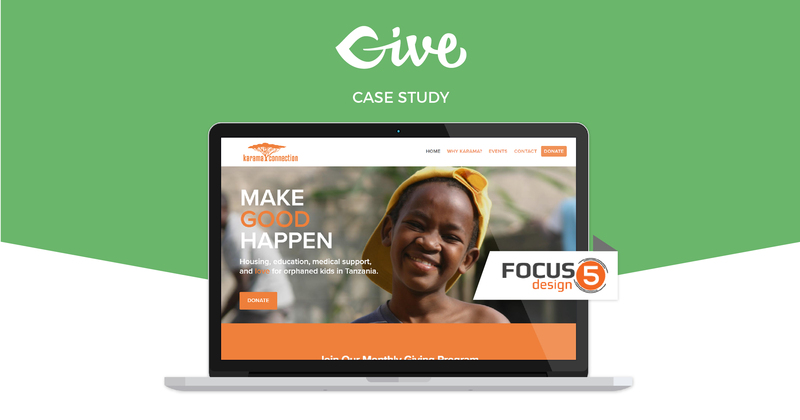 Focus 5 Design is a design, brand, marketing, and web agency located in Cincinnati, Ohio. Their motto, “Build a better community by building better businesses,” was birthed because of that “itch” that many of us have to improve our communities and daily living. Focus 5 Design Founder, Patrick McGilvray knew he could move his community forward by taking his twenty years of experience in the corporate technology industry to help businesses grow. And even though he was relatively new to WordPress, he was no beginner at business. Led by philanthropist, Connie Naber, Karama Connection provides housing, education, medical support, and love for orphaned kids in Tanzania. Connie’s a natural problem solver and once she saw the broken orphanage system as it relates to children with HIV/AIDS, she knew we could do better. No kids, regardless of race or where they are born, deserve to be thrown aside. So, Connie did it. She built an orphanage to impact those children affected by HIV/AIDS. Connie travels to the area about once a quarter, continuing to expand her Cause. Connie, though a successful business person and community figure, needed a way to accept donations online — as a way to attract smaller donors beyond her big fundraising events. And she’s savvy, so she can easily manage her email list, update her webpage, and manage donors and event calendars with Patrick’s team — who developed the site with that purpose in mind. Focus 5 Design develops on the Genesis framework. Prior to selecting Give, they tried a few other plugins before landing on Give. Ultimately, Focus 5 Design went for this project because it served their needs out of the box. Would you consider Giving to Karama Connection? More on their organization can be found here.